The Buyer must go to a Western Union Agent Location and make a Money Transfer to the name of the TNT Agent who is responsible with the transaction - XXXXXXXXX. 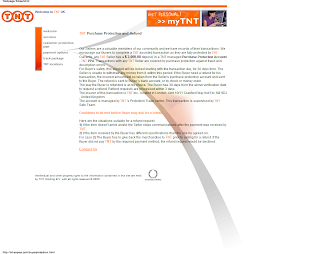 In order to complete the Money Transfer the Buyer will need the Payment Details of our TNT Agent. 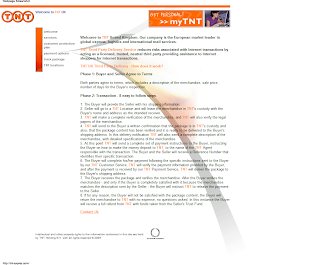 The Buyer will receive these details in the " TNT Transaction Details - Payment Instructions " email received from our TNT Customer Service. With these information you fill in the Western Union " To Send Money Form " and complete the money transfer. After you complete the payment you need to send the Payment Information for verification to our Payment Service at their e-mail address: TNT On-Line Payment Service. IMPORTANT** :The TNT Payment Policy for this transaction is through Western Union Money Transfer - for amounts between US $1,00 and US $4,999.99. *Important Note: The Payment must be made at one of Western Union's Agent Locations, in person by the Buyer. The payment must not be made using Western Union's Send Money Online Service due to the high Credit Card fraud risk. We will not confirm any payments made online. Our Sellers are a valuable members of our community and we have records of their transactions. We encourage our Buyers to complete a TNT assisted transaction as they are fully protected by TNT. Currently, any TNT Seller has a $ 2,000.00 deposit, in a TNT managed Purchase Protection Account - TNT PPA. Transactions with any TNT Seller are covered by purchase protection against fraud and description errors. For Buyer's safety, this account will be locked starting with the transaction day, for 30 days time. The Seller is unable to withdraw any money from it, within this period. If the Buyer need a refund for his transaction, the insured amount will be taken from the Seller's purchase protection account and sent to the Buyer. The refund is sent to Buyer 's bank account, or by check or money order. The way the Buyer is refunded is at his choice. The Buyer has 30 days from the above verification date to request a refund. Refund requests are processed within 3 days. The insurer of this transaction is TNT Inc., located in London, Unit 10/11 Cranford Way Ind Est ,N8 9DJ , United Kingdom. 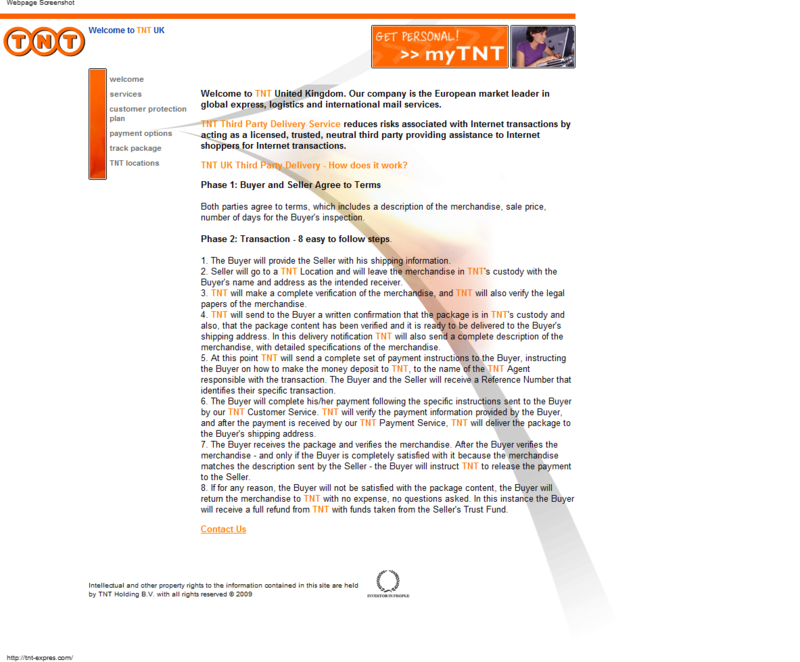 The account is managed by TNT 's Protection Trade center. 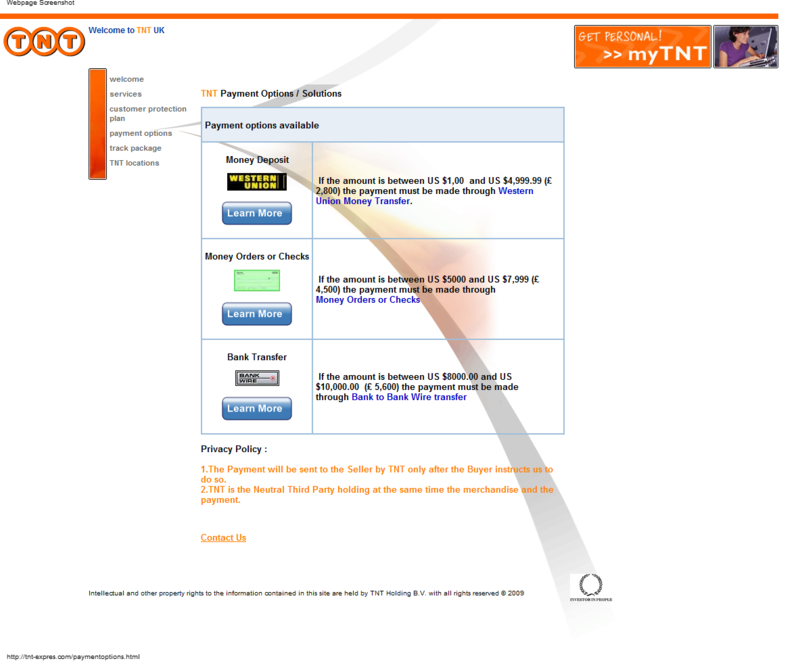 This transaction is supervised by TNT Safe Team. For case 2) The Buyer has to give back the merchandise to TNT prior to asking for a refund. If the Buyer did not pay TNT by the required payment method, the refund request would be declined.